On R.U.R., the Shanghai Restoration Project looks at the human legacy through the eyes of rhythmic robots - and never sacrifices emotional depth to do it. When Dave Liang first put together the Shanghai Restoration Project, it was an electronic take on 1930s Chinese jazz: sweet, swinging vocal pop with catchy hooks and a borderline kitschy warmth. Like its namesake city, though, the Project has grown in leaps and bounds over the years, churning out ever-evolving albums and collaborations that echo with rhythmic evocations of traffic and the melody of Shanghai's nigh-unrivaled urban cacophony. 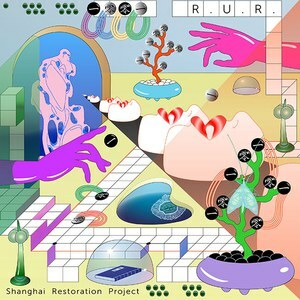 Now a duo with the addition of artist Sun Yunfan, Shanghai Restoration Project's new album R.U.R. tells the story of a future that might not be too distant, in which robots have replaced and all but forgotten humankind. Over the course of the album, the automata seek to learn and understand the beings who came before them and all their strange, sometimes self-destructive behavior - our behavior. This story reveals itself in the music of R.U.R. (named after Čapek's 1920 play, subtitled Rossum's Universal Robots). Layers of nature - found sounds of animals and rainforests - and machine intersect, weaving in and out of a shared soundscape ready for thorough exploration. Evocative song titles guide the narrative; "Last Bachelor Oecanthus" bounces, driven by insectoid scratches and sprightly piano flourishes. On "Library Breakin'", nighttime jungle ambiance encroaches on a tranquil melody. Underlying each piece is a sense of introspection that adds a depth of emotion to an often whimsical collection of sound. This is crucial on some of the thinner, cheaper sounding songs; the Windows 98 alert sound-a-likes on "Spooky Party" are saved by the sense of suspense and excitement in the low-range buzzing and ethereal syncopation on either side of the main line. "Alpha Go" could be any generic mid-2000s, made-for-movie-credits electronica track if it weren't for the hope in the keys that back the wordless vocals. This contrast and interaction between the human and the electronic is both eerie and poignant - central to R.U.R. 's aesthetic. Perhaps Shanghai Restoration Project's greatest strength throughout its discography to date is its ability to capture a sense of wonder. On R.U.R., the stakes for this are higher than ever; without that wide-eyed curiosity, the unspoken plot would fall flat and become a linear story about robots on a dry fact-finding mission. Instead, everything we take for granted in society takes on a fresh importance. "Tropical Spice Garden" starts out as a skeleton of beach party music, but roosters crowing and lush melodic lines of synths and vocals find the beauty in every leaf and grain of sand. The chaos of "Supermega Cosmomall" constantly threatens to overwhelm, amplifying modern consumerism into a towering, almost awe-inspiring frenzy. Just when it begins to be too much, the album reaches a soft landing as closing track "Telemicroscope" lets us float away from Earth. It's a much needed break after such an immersive experience. Shanghai Restoration Project has, true to its name, always had an affinity for urban interpretations. R.U.R. may be larger in scope, but the city's influence is unquestionable. Noise, sonic diversity, and fast paced beats mark each song. It's hard not to miss the more human sounds of earlier albums as giving us something familiar to hold onto amidst the electronics, but R.U.R. both shows off technical expertise and gives us a chance to experience the modern world from the point of view of a fictional outsider - not a unique tactic in art, but one with endless permutations and possibilities. Thoughtful and exceptional, R.U.R. sometimes brings its robotic conceit near a point of inaccessibility, but Shanghai Restoration Project always pulls it back to a more organic place, bridging the gap between story and audience as it looks at our potential human legacy. Chris Cohen's self-titled third solo album is as unassuming as it gets, yet it is unequivocally quality work by an extraordinarily skilled artist. Plus there's sax solos.